How would you like to zip from Los Angeles to San Francisco in less than 30 minutes, on the cheap and on your own schedule? 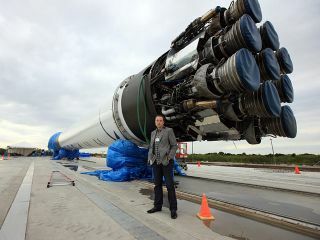 Billionaire entrepreneur Elon Musk says it can be done, and he's going to tell us how next month. Elon Musk, the visionary behind electric-car firm Tesla and the private spaceflight company SpaceX, has been teasing us for a year about something he calls the "Hyperloop." This new solar-powered travel technology, Musk says, would go twice as fast as an airplane and be completely crash-proof. The Hyperloop would also be a cheap way to get around, with tickets costing much less than a seat aboard a plane or train. And there would be no scrambling to make a set departure time — you'd be sent on your way whenever you showed up at the station. Musk has described the Hyperloop as a "cross between a Concorde and a railgun and an air hockey table," inspiring speculation about passenger-packed pods being blasted pneumatically through vacuum tubes. A diagram of such a system drawn up by self-described "tinker" John Gardi "is the closest I've seen anyone guess so far," Musk tweeted on July 15. (See the diagram on Gardi's Twitter page here.) But Musk has mostly remained mum, keeping details about the Hyperloop to himself. He has said he will publish a design of the concept by Aug. 12, so we'll all just have to be patient for a few more weeks.